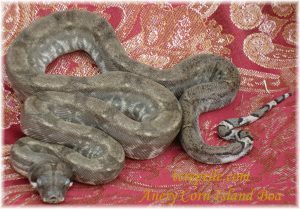 In 2012 I produced a litter of Corn Island Boa. That litter gave me 7 perfect babies with zero slugs or stillborns in the litter. I was so pleased with the results since the babies came out so very red with the exception of two individuals that were initially a drab disappointment compared to their litter mates. 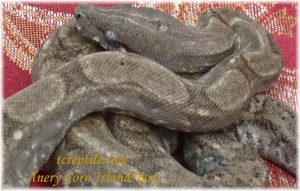 Corn Island Boas are known for their red undersides and flanks. This trait is one of the qualities that inspired so many keepers to be interested in them. 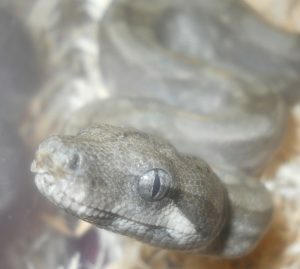 Corn Island Boas are also unique among the boas I have encountered in regards to their personality. They are very curious and outgoing boas. As a matter of fact they can be quite stubborn about it. 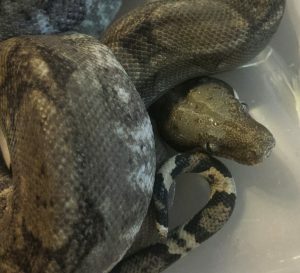 I have found them to be mild tempered boas but very active. The babies had their post parturition shed and I realized that those two neonates were something other than just lacking in color. They were lacking red pigment entirely. 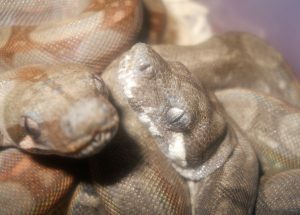 An unexpected gene mutation had presented itself in this litter of boas. 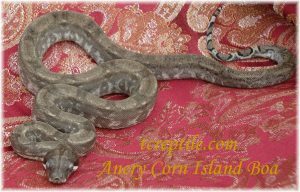 Those two offspring are still to my knowledge the only anerythristic pure Corn Island Boa in the US. Two out of seven babies came out anerythristic. Those are the expected odds from a pair of boas heterozygous for a recessive trait although it was unknown to me or anyone else that the parental stock even carried the gene mutation. By all accounts the anerythristic trait is encountered much more regularly in boa constrictor from Mexico and Central America. Both “anery” boas are males. 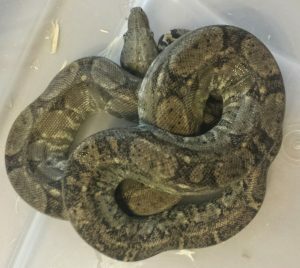 Here are some pics of these interesting little boas. The last photo is of an “anery” beside a normal. 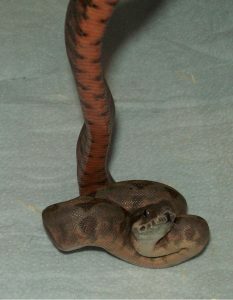 The very unique look of a wild type Corn Island Boa contributes to a unique appearance on the anerythristic offspring. 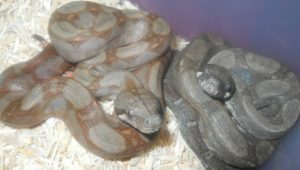 These are pure offspring from my Rio Bravo Reptiles bloodline boa. ***An update follows. In 2017 I was successful in pairing my two anery males with my two large adult females. Two litters were the result and I produced another anerythristic male from the female who produced the two original anerythristic males in 2012. Both females produced but it seems the het for anerythristic female possibly experienced a failure of some kind with one ovary. Over half the litter were slugs. Below find some photos of these neat little boas as well as a few shots of an anerythristic posed with a normal sibling. Here we have a young Corn Island Boa showing off the colors these boas are known for.